I stopped by the Rastelli Market on my way home from work (which is a nifty higher-end grocery store, kind of like Whole Foods, but less pretentious) to get some fancy cupcakes from their bakery when this caught my eye. 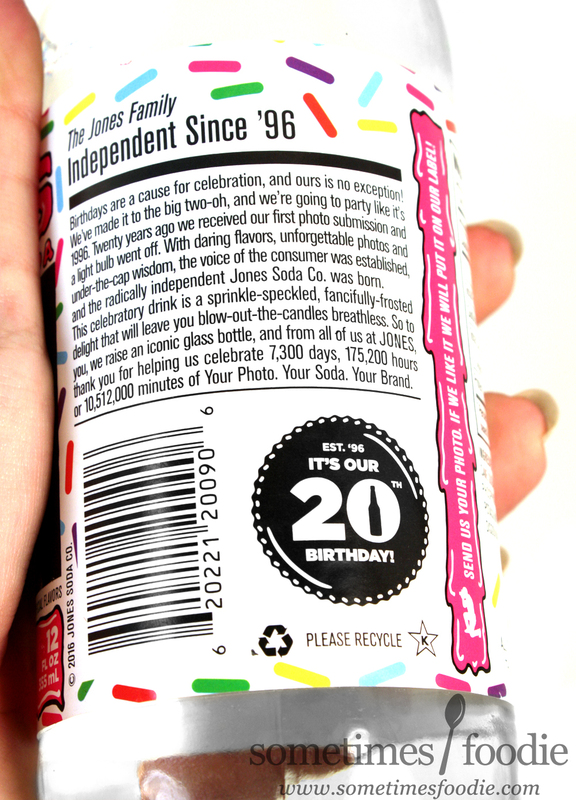 Just like Airhead's, who released a Birthday Cake flavored candy earlier this year, this was done to celebrate Jone's 20th anniversary. The timing couldn't have been more perfect! I grabbed a bottle of this stuff, along with my cupcakes, and excitedly drove home to celebrate. Now, this soda company will always hold a special place in my heart, but they really disappointed me a few months ago when they released those lackluster, artificially sweetened, sodas with 7-Eleven. I've only reviewed two flavors from that line, but that was more than enough to know that it's nothing like the original. Those plastic bottles were loaded with my arch enemy, sucralose, which triggers my vertigo, so I won't be trying any of their other flavors any time soon, but this? There's no sucralose to be seen! Not only are the ingredients better than the 7-Eleven variety, but this packaging is better too! We have a glass bottle, which always makes soda taste better (even if it's just a placebo effect inside my head), and the label is colorful, unique, and quirky. As always, it features black and white photos sent in by fans/customers, and this one is birthday-related, of course, but the rest of the label design provides a much needed POP of color. 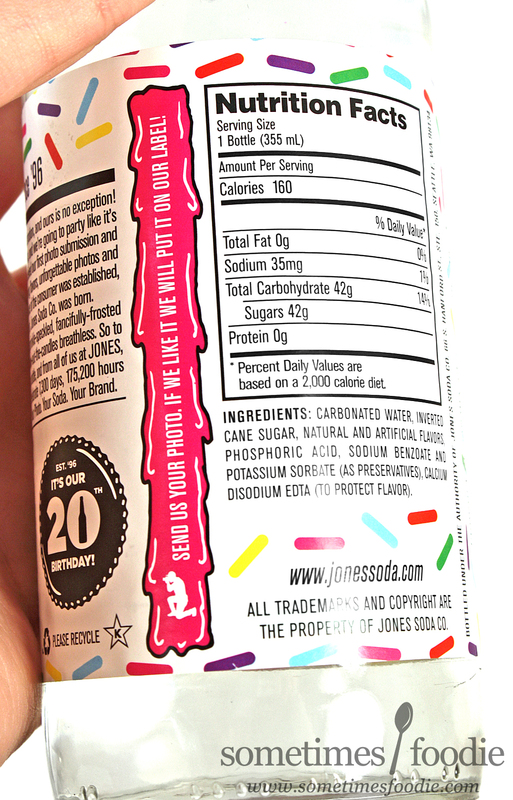 We have scattered rainbow sprinkles (aka jimmies for you Philadelphians) and the flavor information is playful and squiggly, mimicking hand-piped hot pink icing. It's playful, but simple, and it doesn't overwhelm the product itself. This is more like it. I waited until after my boyfriend blew out his birthday candles before pulling this bottle out of it's hiding spot for us to try. He's not a very adventurous eater, but he was a good sport and happy to try this with me. We twisted off the cap and the clear liquid inside smelled EXACTLY like cake frosting. I am so impressed! A lot of products out there try to mimic the scent of birthday cake, like candles and perfumes and stuff, but this is SPOT ON! It smells exactly the same way that fluffy, shortening-based, vanilla frosting from most commercial bakeries taste. I'm hype! I took a sip, and it tastes exactly like it smells! It's an incredibly bizarre feeling, because it tastes just like cake frosting...and you're drinking it...but I really enjoyed it! It tastes like fluffy, waxy, vanilla-based, buttery cake frosting! Normally I'm not a fan of cake-flavored sweets, but I really liked this a lot! It's too sweet for every day drinking, but I'm a grown adult so I shared some of this with my little buddy Jamie (who's 10) and she flipped out. 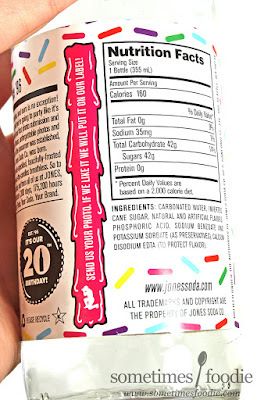 Safe to say, kids will LOVE this stuff, but even though it's a little too sweet for me, which inhibits it's drinkability, I'd still buy this again. The flavoring is impressively authentic, the packaging is fun and colorful, and this would make a great gift for anyone's birthday.